AnDAPT™ today announced the release of a portfolio of five Adaptable Power Management Integrated Circuits (Adaptable PMICs) built on its disruptive AmP™ platform ICs. 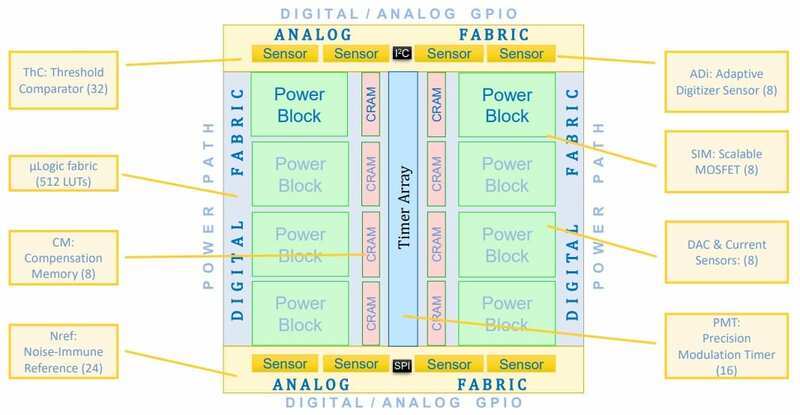 With this unique technology, AnDAPT is able to rapidly release a multitude of Off-the-Shelf PMICs with entirely different topologies, covering a broad spectrum of customer applications, while relying on a single pre-tested and characterized monolithic AmP IC. Pictured above, the AnD8400, AnDAPT’s first Adaptable PMIC, integrates four synchronous buck converters, four LDOs, sequencer and power management in a single, monolithic AmP IC, packaged in a thermally enhanced 5mm x 5mm QFN. Adaptable PMICs can be used as-is by customers without software programming yet offer best-in-class flexibility and time-to-market, eliminating the cost and development time of traditional custom PMICs. They offer compelling combination of high performance, small form factor, flexibility and ease of use. Configuration options are also available using AnDAPT’s new WebAdapter™ tool. The AnD8xxx product family features a compact 5mm x 5mm package and a high level of integration in order to provide best-in-class system solution to power chipset, processor and memory. Adaptable PMICs are also available as “soft” PMICs on AnDAPT’s On-Demand PMIC WebAmP™ tools, allowing user desired topology changes, for a fully customized PMIC, without the cost (no NRE) and the development time (no mask, no qualification) always required with custom PMICs. AnDAPT is uniquely positioned to bring to market advanced power management solutions, with an extensive library of power components and topologies. On The Web: AnDAPT, Inc.